In the Audio Lotus McCann Worldgroup Philippines leads the way with 2 finalists and Leo Burnett Taiwan scores 3 finalists in Branded Entertainment Lotus. In Film Craft Lotus Tohokushinsha Film Corporation have 7 finalists followed by GreyJ United Bangkok with 4 finalists. In Film Lotus Hakuhodo Tokyo has 5 finalists. 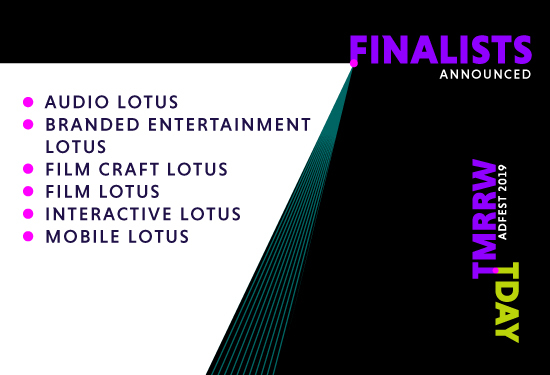 TBWA\Hakuhodo Tokyo and Dentsu Tokyo have two finalists each in Interactive Lotus. In Mobile Lotus Cheil Worldwide Seoul and Cheil Worldwide India have two finalists each.